Who would win: Ripley or Columbo? The question is not an idle one, since there is a perfect structural symmetry between the two characters: Ripley, the leisure elite fake, who outwits all the cops who suspect him but who can prove nothing; and Columbo, the implacable hunter/ haunter of the wealthy and privileged, who uses the very arrogance of his prey to trap them. An encounter between Ripley and Columbo would bring together two characters whose genealolgy can be traced back to Dostoyesvsky’s Crime and Punishment. Ripley was a kind of Raskolnikov in reverse, not using murder to prove his superiority but to attain a higher social status, while Columbo was famously based on Porfiry Petrovic, the detective who circled around Raskolnikov until the young student was undone by his own guilt. It is hard to imagine Ripley breaking in the way that Raskolnikov does, since he does not have a guilty conscience that can be played upon. Similarly, it is hard to imagine Columbo – the implacable agent of Justice in shabby garb - giving up in the way that Ripley’s hapless police adversaries end up doing. 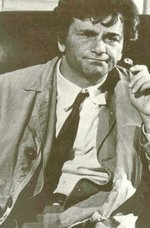 Columbo’s victories do not depend on knowledge – the preternatural thing about Columbo is that he knows immediately who the killer is – but upon proof. ‘Proof’ is the moment when knowledge of power’s obscene underside passes over into the Symbolic. Yet there is no-one who respects the power of the Symbolic more than Ripley, no-one who would be more careful to avoid condemning himself in the eyes of the big Other. If Columbo could not manipulate Ripley’s conscience, he might be able to use his jouissance. Ripley does not enjoy killing but he does enjoy demonstrating his prowess for disguise and mimicry, and he enjoys the threat of his status and wealth being taking away. What other explanation is there for his willingness to centrally involve himself in schemes which are so risky? A clue to Ripley’s jouissance comes when when, towards the end of Ripley’s Game, defending Belle Ombre against mafia gunmen, Ripley (apparently inexplicably) laughs. But perhaps Ripley would do what none of Columbo’s adversaries do and simply kill the detective. Daniel is right to argue that ‘The very special delirium of Ripley is that, effectively, he is being judged by the big Other on precisely how well he performs the part of Ripley.’ But, if the big Other does not exist, who is doing the judging? Ulimately, the answer has to be: Ripley himself. Part of the reason that Ripley kills Dickie Greenleaf in the first place, is that, if Tom plays the part of Dickie, he can function as his own ego-ideal. Dickie has failed to perform adequately as Tom’s ego-ideal; becoming Dickie both allows Tom to escape the turmoil and shame of (one aspect of) his own subjectivity and to ‘correct’ Dickie’s mediocrity and vulgarity by playing the role better than Dickie could himself. The Dickie performance prepares the way for the possibility of a Tom Ripley identity that Tom can perform without a sense of shaming inadequacy. I don’t think it is quite true that Ripley can never achieve success. It is, rather, that success is not in itelf sufficient – Ripley is perfectly happy at Belle Ombre, but who be satisfied with happiness? That is why, in order to experience enjoyment, rather than pleasure, Ripley has to keep putting his Status at risk. The question Carl poses at the end - ‘how do you Wyatt a bar full of Resonance FM listeners.... a bar full of super eclectic, super ironic Fashionistas (I'm guessing M-People's " Elegant Slumming", is pretty much the key. )’ – makes it clear that what constitutes Noise is structural position rather than any inherent features of the sound itself. 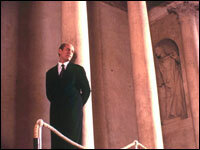 Wyatting can be seen as one response to the impasse that Simon described in his piece on Noise in Blissed Out: without a big Other who can be annoyed and scandalized, Noise loses it cache.